I recently read with fascination Tom Mahood’s account of his investigative role in uncovering the fate of a German tourist family who vanished while traveling in Death Valley National Park. Mahood stumbled on the story on the internet, twelve years after the family disappeared. In 2008 he read that a Death Valley Ranger performing an aerial search for illegal drug operations, had spotted a passenger van on an abandoned desert road. “The van was clearly stuck in the wash, sunk up to its axles in the sand, with its two rear tires flattened and its left front tire also flat,” Mahood writes in a measuredly ambling voice. Despite his casual gait I felt my heart rate increase, having myself been confronted many times in the desert with flat tires, a mired vehicle and, once, a vehicle we had to abandon. Hooked on the mystery, Mahood undertook a long and rugged trajectory. He learned that the German family who rented the van in July of 1996, didn’t make their flight back to Germany–and were listed by Interpol as missing. He learned that in the fall of 2008, the same year the van was discovered, a search of the Anvil Canyon area where it was found produced no clues as to the family’s whereabouts. He joined the Riverside Mountain Rescue Group and began to study search-and-rescue skills. He conducted interviews, studied evidence, poured over reports. He speculated, reconstructed, theorized. He made rigorous trips into the region, renewed general interest in the travelers’ fates, and generated new interagency searches. No one knew where we were or when we were planning to return; no one would be looking for us in time to effect the outcome. We didn’t know it then but the route we had driven into the canyon was the most infrequently traveled of three, and therefore the one on which we were least likely to encounter help. Our map was not informative enough to help us deduce that. Our water supply consisted of two-dozen 16-ounce plastic bottles. We had small back-packs, making it impossible to carry enough water for a 40-mile hike in which we would have been exposed to the sun in treacherously hot weather. Furthermore, we had only been to that canyon once before. We might have taken a wrong turn while attempting to retrace our route. It’s easy to get lost in the desert, just as our rescuers did after they agreed to transport us back (eventually they got reoriented.) They appeared in the canyon where we were stranded, a couple of hours after we broke down. They told us they had driven many, many hours to arrive at that remote spot, where they were planning to camp. The outcome for the German adventurers lost in the Death Valley was not miraculous. Like us, they were stranded in a remote region. Like us, they told no one where they were going (they did note in a guest log along the way that they were heading over a pass, but it was not a log anyone checked.) Like us, they didn’t have enough water. Like us, they had a map that was not useful for ascertaining the most viable way out. Tom Mahood’s determined efforts to discover their fate, eventually resulted in the finding of human bones. DNA tests confirmed the remains were those of Egbert Rimkus, 34, of Germany. Rimkus’s son, Georg Weber, 11, his girlfriend Cornelia Meyer, 28, and Meyer’s son, Max, 4, are still missing and presumed dead. 1: Survival is not a given. After a crisis, the difference between what you brought with you and what you needed–but didn’t have–will appear as the difference between preparedness and recklessness. Non-negotiables are water, prescription medications, food, clothing, tools for starting fire and for vehicle repair, sleeping bags, navigational materials, and recovery gear for your vehicle (if nothing else, a shovel.) Prepare for the worst, even if you are “just going to…” and even if you plan to travel mainly by paved roads. 2: Desert maps are often inaccurate. During our first few trips into the Nevada desert, I struggled to believe how inaccurate our map was. We bought another map and found it just as unreliable. Eventually I discovered that by using the maps in tandem, I was able to piece together routes. Typically I document mileage at every junction, and take notes along the way, describing anything and everything distinctive, which is often not much. I also make notes like, “at the third fork we bore left on the way>bear right on the way back.” That way, if we encounter several successive roads which are not on the map (which is common,) I’ve reduced the possibility of confusion. 3: Lost people walk in circles. In any wilderness, including the desert, many people who get stuck or break down, become lost after leaving their vehicles. 4: One good decision could save your life. In 1998 Mathew McGough drove into the Australian outback, planning to camp for one night with his daughter. They became stranded after two tires were punctured (they had one spare.) McGough decided to drive the compromised car anyway and set out to the west, although he was uncertain which way to go: “…turned out it was the wrong way.” He later burned the car, hoping to attract attention…then fully realized the impact of having no car. What kept him and his daughter alive for a week in the outback in 100-degree temperatures, was his decision to wet them down daily using water from the radiator and bury them both in the ground. Eventually he stumbled on a little-used road and flagged down a rescue. 5: Search parties frequently overlook signals for help. A common theme in survival stories is of search parties and other travelers not seeing a stranded party’s signals for help–including smoke and fire. It is advisable to carry flares, brightly colored blankets or tarps, and mirrors or other shiny objects and use them in addition to fire to signal. The duration of a ground search and the number and frequency of aerial searches can be affected by budget and evidence of reason to continue. Be sure the person with whom you leave your itinerary, is savvy enough to keep the search for you search alive. You make very good points. One of my favorite books is “Deep Survival” by Laurence Gonzales – good for explorers and just for life in general. And in case you haven’t read him, Craig Childs writes wonderfully about being in the desert. WOW! Great article! It really opened my eyes. I can easily imagine myself as one of those unprepared people. Thank you Vivian. Thank you for your feedback. It’s one of those things where we don’t know how much we don’t know until… 🙂 Some of your blog’s themes are relevant to surviving in the desert, i.e. advocating awareness of dependence on comfort and consumerism. Surviving in the desert is really the antithesis of those. Very informative and important! I lived in Arizona and know firsthand, how easy it can be to “Get Lost.” Such beautiful earth, inviting yet treacherous. Never take it for granted. Very helpful info, Vivian, and it comes at a time when I need to hear it. So far, I’ve not wandered too far off paved roads in the desert. However, I’ve been tentatively planning a trip to Namibia – that magnificent desert is one of my dream destinations. While Namibia is one of the safest African countries for a solo female traveler, the most dangerous thing is driving from place to place. Most of the roads are gravel or packed earth. There are unexpected sand pools and, of course, many animals. Distances are long and desolate. I’ve driven a 4×4 once, almost 20 years ago, in Papua New Guinea. I’ve had break downs, near populated areas, but I’ve never had to deal with a flat tire. I would be driving to the most visited places, but this is totally relative. Plus, I’d have to watch out for other tourists who have no idea how to drive on gravel or sand. Lots of them die every year from stupid driving. Your post reinforced the fact that I might have to put this dream on hold until I can find someone (a more experienced off road driver) to go with me. I would be reticent to encourage you to travel to the Namib Desert alone if you are not a somewhat experienced mechanic, but that’s not to say it couldn’t be done. You definitely want to be able to change a tire and it would be a good idea to carry a couple of spares. I assume you’d be using a rental? I’d be concerned about reliability and look carefully into the reputation of the rental company. Tourists probably tend to beat on those vehicles. I did a quick search on the Namib, and it looks like there is a fair amount of tourism in the region: ATV’s, expeditions, etc. That suggests that there is likely a generally hospitable attitude toward tourists which could garner you help from passers-by, were there any. On the other hand, being stranded alone on a desolate desert road obviously has its risks. I’ve asked myself whether, if I lost my husband, I would travel solo in the desert; the answer is not a resounding yes. Sounds like a great trip, I particularly look forward to hearing about this one, Julie. Thanks so much for your input, Viv. After many hours of searching, I was about to give up on the idea. I read so many horror stories of losing precious days from the trip because of breakdowns far from towns. And it seems the rental companies charge an exorbitant rate for every little scratch. Then I checked into guided trips, not expecting any success. I’d looked a few years ago and they were way out of my budget. Namibia is known as a luxury destination. But I found a couple of companies that are totally in my price range, go where I want to go (Sussovlei & Etosha), and have a good reputation. So, hopefully next summer, I’ll be there. 🙂 Namibia has been in my top 3 for forever. Thanks Vivian, for caring enough about your readers to post this thoughtful article. Don’t forget to add prayer as a “must do” in preparation! Wow Viv, what a useful post. I hope many will keep and take it seriously. Thank you, Joanne. I know I often find the experiences of other desert travelers helpful and instructive, and I’m happy to share mine. Very well written. Most people will die if they get lost in the desert/vehicle brake down etc. It is life saving to be prepared. So far I have not experienced it, but I am prepared for it. I always bring survival food/water/clothing and an uber sharp pocket knife (could be used as a tool/weapon etc.) I would stay under my vehicle until after dark, and walk without the sun frying me. I also bring a reliable GPS, programmed for the area I’m visiting. On Cabela’s they sell those programs, very reliable telling you exactly where you are, who owns the land, land features etc. They cost about $100/region. Definitely worth it!! This is the map system I’m using http://reviews.cabelas.com/8815/270124/onxmaps-hunt-premium-maps-reviews/reviews.htm. I do go deep into the desert, sometimes alone, but I prefer to have a friend with me. I try to map out on an actual physical map, before I go. I tell someone where I plan to go, and use GPS coordinates as well. The Just the GPS does not work 100%, with the extra hunting program it works very satisfactory. It took a while to fully understand it (I probably have more to learn.) My husband is a very good navigator. We often compare our routes, and talk about where to go. It is scary during the hotter part of the year. I should definitely be taken seriously. I enjoyed reading your view of it. Nevada is definitely one of the most beautiful places on this earth, surely it’s worth it to take some time to prepare. It kind of makes it more exclusive, don’t you think? Wow, what an interesting, informative article! Doing most of my adventures in less remote areas, I never thought about much of this! It’s valuable information for even someone like me. You never know when you could be stranded. Nicely done! Thank you very much…traveling in the desert wilderness has made me acutely aware that it’s something we can easily take for granted, the safe passage from point A to point B. A little forethought and some basic precautions can go a long way toward preventing a painful or even a tragic incident. Happy Trails! This post just made me realise how unprepared I have been in my travels! I am currently reading Cheryl Strayed’s Wild, and that is an eye-opener about un-preparedness too. Thank you for writing this piece. I am definitely going to follow these points through and through! Yes, she runs out of water in that part of her trek! It really is a wonderful read, and I am sure you will enjoy it as much as I did. I used to hike alone and not tell anyone where I was going, what route I was taking. It was because I was new to the area and had no friends to tell or travel with. How stupid can one person be? Thank you for this post. Great advice. We lived in southern Nevada for many years – loved the desert – especially in full bloom (most people don’t realize how beautiful cactus flowers can be). Traveling with a small child, we didn’t venture too deep into the desert. Always made it a point to tell our neighbor and to bring plenty of water even for a short trip. You just never know . 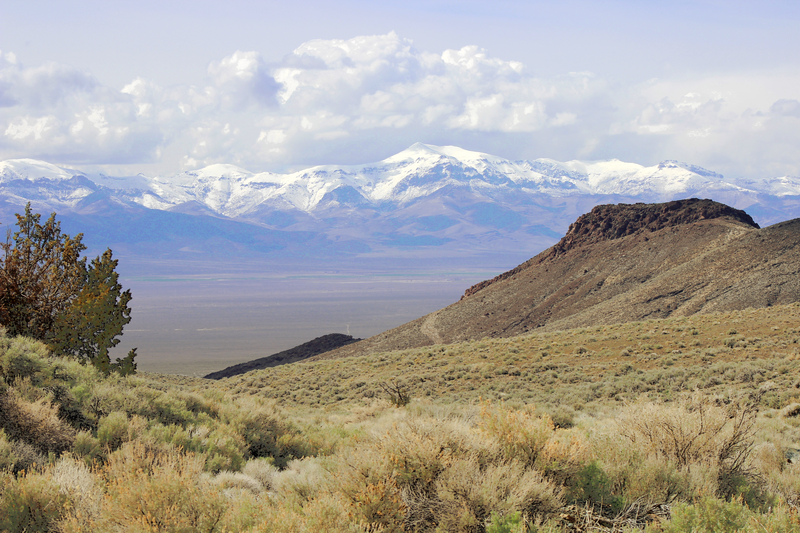 . .
Love your blog and share your appreciation of the NV high desert. We are working on an initiative to protect wild horses of Kamma Mountains, Blue wing, etc and would love to speak with you. Could you email me at sroy@wildhorsepreservation.org? Thanks! Thanks, Tim, I appreciate it! Thank you for visiting and for taking the time to leave me such a nice note. I am delighted that you appreciated the post.